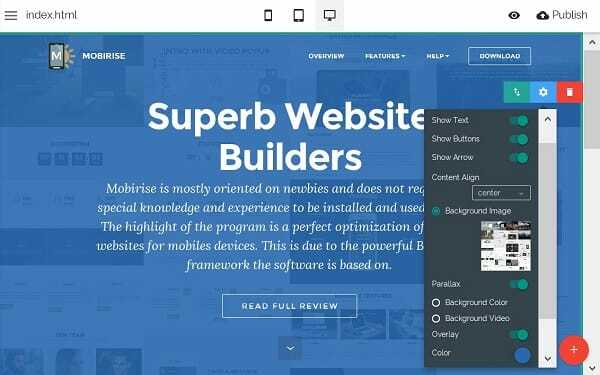 Mobirise (The current version is 4.9.5) is an offline website builder that has recently become available for Windows, Android and Mac. The program is used to create promo websites and landing pages. Mobirise is absolutely free both for commercial and non-commercial use. Just download it, install and… enjoy creating as many websites as you need without any limitations! Mobirise is mostly oriented on newbies and does not require any special knowledge and experience to be installed and used properly. The highlight of the program is a perfect optimization of Mobirise websites for mobiles devices. This is due to the powerful Bootstrap 3 framework the software is based on. 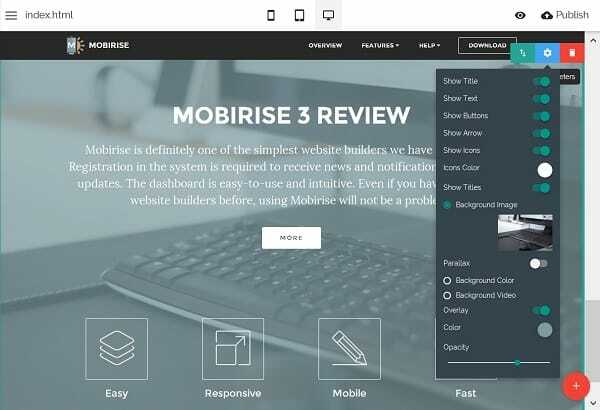 Mobirise site builder seems a bit unusual, so let’s have a look under the program’s hood to find out the features that may attract the attention of users. Mobirise is definitely one of the simplest website builders we have ever tested. Registration in the system is required to receive news and notifications about recent updates. But for work with Mobirise, you should only to download the program and install it. The dashboard is easy-to-use and intuitive. Even if you have never used website builders before, using Mobirise will not be a problem. The interface is functional and appealing. Based on the WYSIWYG editor that supports the ‘drag-n-drop’, it allows users creating the structure of any website in less than 20 minutes. Filling the site with content will take the rest of your time, depending upon your web design needs and objectives. Anyway, creating an impressive landing page or a promo website will not take it longer than a day, even if you have zero coding skills and expertise in the niche. Mobirise is created to build small websites, including landing pages, portfolios and different types of promo websites. The dashboard is very simple and contains visual editor, settings menu and a panel to add all types of blocks. One of the Mobirise unique features as an offline software is that you will have to upload the project you have created to the chosen hosting. It is up to you to select the domain and hosting provider. This is what makes the system similar to CMS. On the other hand, the program looks much simpler as compared to the majority of other website builders. To publish a site, you will need to buy hosting plan and set up the route for uploading website files. Further updates are made in one click only: you just have to make the changes, activate the “Upload” button and that’s it! By the way, hosting updates involve only those files that have been changed, but not the whole website. This does not require much traffic and time and you can even use mobile Internet to complete the task. Apart from that, you can publish your websites at the local server and resources like Google Drive, Github, Amazon S3 etc. Updates require the availability of a computer or mobile phone with website files. This makes it possible for you to upload the latest version of the website to any cloud while being away without having your computer at hand. Likewise, you will have access to this website version from any location you are in. One of the most outstanding Mobirise highlights is the AMP (Accelerated Mobile Pages) Website Builder. This is the open-source tool, the application of which allows boosting the performance of your mobile websites. Projects developed with AMP Website Builder have nice visual appeal and perform great across all distribution platforms and devices. Smooth and Fast Website Loading and Performance. AMP websites load faster and feature smooth performance. This helps retain users, who visit a website and contributes to traffic generation. Effective SEO Promotion. When it comes to the search engine ranking, websites created with AMP Website Builder have a priority. This is because they are 100% mobile-optimized and come with the AMP icon assigned to them by Google Search. So, when a user looks for a website by using a mobile device, these websites are displayed first. Content Goes First. AMP websites are a perfect solution for content-focused projects, which have to be downloaded quickly to provide smooth browsing experience. These include landing pages, news portals, blogs, Internet magazines etc. No Coding Needed. Creating AMP websites with Mobirise is super-easy as it doesn’t require any coding skills. The tool offers a set of AMP components used to add, adjust and rearrange the templates without any code editing at all. These components include AMP Header, Menu, Footer, Map, Video, Image, Article, Navigation etc. Templates. The list of AMP website templates available in Mobirise is impressive and can be effectively used to launch standard websites, portfolios, eCommerce websites, landing pages and one-page sites. When it comes to creating mobile web pages that load fast and ensure convenient web browsing experience, Mobirise AMP Website Builder is the best tool to get started. It contributes to effective customer engagement and high website traffic. Help me! lets you use the follow-up form to contact the developers. Footers represents 4 variants of footer designs. By dragging any blocks described above, you will be able to build your own site. Having designed the general structure of the project, you will need to adjust the blocks and replace the industry-specific content with that of your own. Listed below are a few examples of how you can work with blocks effectively. You can enable/disable the images of logos, brand names, buttons, menu transparency, choose the background color, size and type of the font and make your menu sticky – while scrolling the page, it will remain on its place. 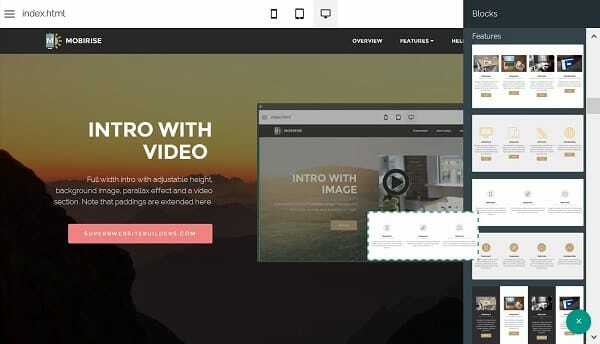 This is where you can add a background video, image or color, choose shadow settings, content align type as well as enable/disable the header, slogan, arrows and buttons. Choose images, adjust the spaces between their thumbnail presentations, enable full-screen format, text, choose background etc. Select the background type (video, image or color), the number of columns, availability of buttons and text, adjust the spaces between the columns. As you see, general settings for various blocks differ a bit, but you can also make use of other options. It is possible to adjust each element separately, like changing icons, texts and button fonts, images, adding your own links and more. Such functionality makes it possible to customize the design of your website to your liking. You won’t be able to change the format of blocks, because this depends upon the chosen template, but it is up to you to change and customize other settings and features. A large gallery of icons of different themes is also worth the attention. You can add them wherever you need, change their sizes, colors and even transform them into links. That’s very convenient. Mobirise comes with a number of free extensions, including Dropdown Menu, Cookies Alert, Twitter Feed, Facebook Comments, Soundcloud and Google Analytics. 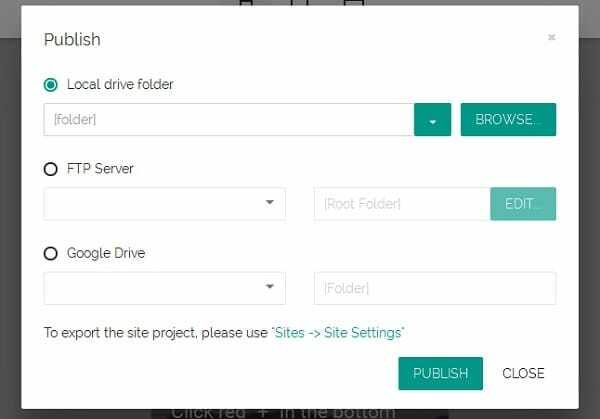 They make it possible to enable website comments, music, adjust statistics collection, add pop-out menu and the notifications concerning the storage of cookie files at your website. To sum up, Mobirise is nearly the ideal mobile website builder for newbies. It is stylish, convenient and easy-to-use. Is there anything else you might need? You won’t find any standard templates in Mobirise. The system has gone far beyond ordinary customization of pre-designed themes, offering a huge collection of ready-made customizable content blocks instead. The blocks are divided into sets known as themes, which are provided both on a free and paid basis with regard to your needs. Each block reflects specific functionality of the system and can be customized as you need. The use of the blocks reduces the need to start web design creation with a template. As of today, Mobirise collection of content blocks encompasses over 1500 elements. 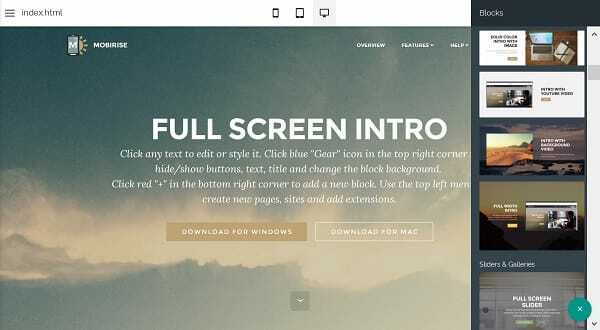 The system offers more than 50 themes and 150 demo pages to help you design your website layout. These include sliders, counters, headers, footers, galleries with lightbox, articles, timelines, images and videos, CTA, Google maps, testimonials, social blocks, data forms, full-screen intros, pricing tables and more. The blocks are designed with regard to the latest trends. They are easy-to-customize and quite flexible. What you need is to pick the required blocks, drag and drop them to the page to further adjust their positions and publish a website. Right after that, you can start editing the content. Sets of blocks make up the so-called templates, which are completely responsive by default. Mobirise templates are based on Bootstrap 4, which is currently the most powerful mobile first framework. This allows even non-tech savvy users create stunning designs from scratch. Mobirise provides customer support via email, video tutorials describing the way the system works, user Forums and Help section. The Forums seem to be quite helpful and active, which contributes to the system popularity and informational value. You can reach either Discussions or Categories Sections, depending upon your current needs and assistance you are looking for. To join the forum and initiate discussions with other users, you need to sign up for it first. There is also a convenient Search filter option that cuts down the search time and helps you find the required content with no hassle at all. Speaking about the Help section, it is quite informative and helpful as well. You can ask questions here, browse articles and look for the answers you currently need. Paid modules come with detailed user instructions as well. All in all, Mobirise customer support is on a decent level. Code Editor ($69) is an extension for professional web designers, who would like to edit HTML/CSS webpage codes manually. All-in-One Kit ($129) All Mobirise extensions and themes in one package. Having purchased any of these extensions once, you will be able to use them forever. New features will become available at the block panel and in the settings section right after the purchase. because of the inability to change the formats of template blocks. Mobirise allows newbies creating small and medium websites like promo sites and portfolios. There are SEO-optimization options, an opportunity to improve the quality of visual content and a range of tools that make synchronization with other popular social services possible. The platform is a nice choice to create ordinary and mobile websites. Mobirise websites look modern, but somewhat similar to each other. To make a website active, you will need to choose hosting and domain. The most complicated aspect for newbies here is setting up the FTP-server to publish website on the web. This is where the software compromises with cloud options in terms of usability. Mobirise is a unique and quality product. The website builder is worth the attention of newbies and can become an ideal start for them. Haven’t tested Mobirise yet? Then it is high time to download, install and explore the system for free!